Week 8 down. Only 4 weeks to go! 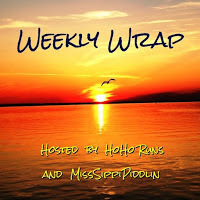 This week in training was a mileage cutback/recovery week and it couldn't have come at a better time. The little ones and I all have some sort of cold or allergy thing going on and the extra rest was very needed. I was very tempted to sleep in on Sunday morning with the rest of the family but talked myself into just getting up. The long run scheduled was a 13.1 mile time-trial and I knew I couldn't keep a quick pace while sick. Well, I made it! The sunset was worth the early wake-up and I covered 14 miles at a comfortable pace. I never regret waking up for an early run — and I almost always regret sleeping through one. My motivation tanks later in the day! This month I had the privilege of trying more of Swanson Health's natural health products. They have something for everyone plus they deliver all over the States — and International, too. Check out their website for more details and to browse their products! I have grown to love the Nuun products especially after a hot summer run! These tablets have made re-hydrating easier because they taste delicious AND All Day tablets provides many essential vitamins and minerals as well. Tri-Berry is still my all-time favorite flavor. All Day Grapefruit Orange: I still haven't found a Nuun I don't like! Motivate yourself to rehydrate with these tablets. The kids and I shared the fruit snacks and jelly beans — we didn't eat them all in one sitting, I promise! Both Annie's Organic fruit snacks and Surf Sweet Jelly Beans are made with real fruit juice. It's a plus that these "treats" are made from quality, natural ingredients. And they are sooooo tasty! Annie's Fruit Snacks: We loved them. I wish there were more than 5 pouches per box! Surf Sweet Jelly Beans: Love the real fruity flavor. Jim's Organic Coffee, "Espresso Jimbo"
My husband and I both love our dark roast coffee. We "brewed" the Espresso Jimbo in our Chemex and enjoyed this organic coffee's deep, rich flavor. We tend to be a little picky on our coffees and Jim's certainly didn't disappoint! Espresso Jimbo: A definite win for dark roast coffee lovers. Tea Tree Oil Cleanser: Leaves your skin feeling smooth, not greasy. It's been a wet year around here and that means more mosquitoes! I hate to use adult bug sprays on the little ones so this was a nice, natural alternative. The essential oil "geranium" is the main ingredient along with a mix of other oils such as lemon, lavender and eucalyptus. This spray was effective with the mosquitoes but those annoying biting flies are relentless. No spray can keep them at bay! Natural Baby Insect Repellent: Baby-safe, pleasant smelling yet still effective! Disclaimer: I received products from Swanson Health Products for review purposes. All thoughts and opinions are 100% mine. This was a recovery week before the last four weeks of training; 2 peak weeks and 2 taper weeks to go. Easy-Effort with double stroller: 6.01 mi, 00:56 @ 09:22 pace. 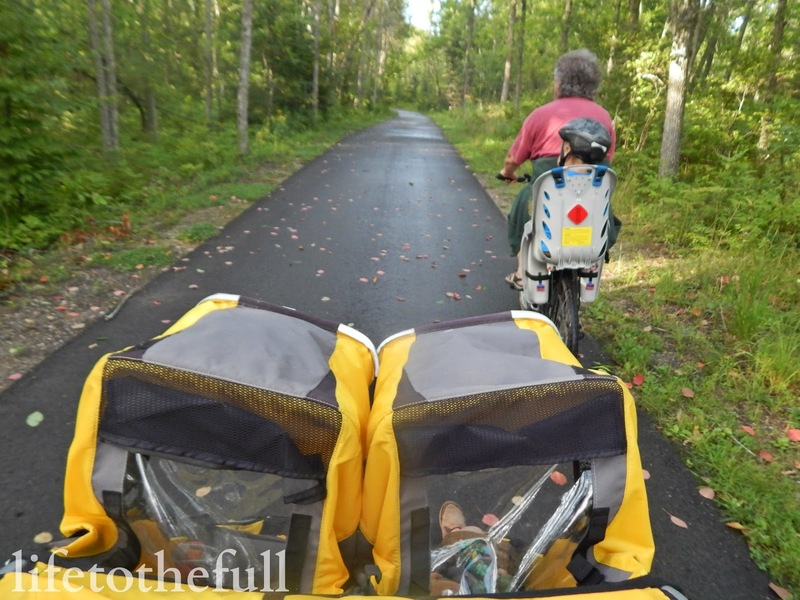 Speedwork with double stroller: 4.5 mi. 00:37 @ 08:12 pace. 4 x 800m w/ 2 min. recovery jog. Reps @ 8:03, 7:31, 7:44, 7:49/mile pace. A windy afternoon for speedwork with the parachute! Strength: 6 x 1:00 planks. Tempo: 7.01 mi, 00:53 @ 07:35 avg pace. 2 x 2.75 miles @ 7:19, 7:14/mile. .5 mile recovery jog in between. 2 easy-effort miles was on the training plan but I chose more rest. The little boys and I all have runny noses and scratchy throats! Either it's allergies from the grain dust or maybe a cold. Long Run: 14 mi, 01:58 @ 08:25 pace. Big toddler is running around the house in his "fast shoes", taking the occasional break to jump off the couch. Little toddler chases me into the kitchen, latches on to my legs and screams the entire time I am trying to get supper finished. Fast-forward to later that evening. Supper in the field was followed by the usual bedtime routine and then lights out for the kiddos. Big toddler went willingly and the little one took some coercing. With likely a dramatic sigh, I sat down in bed and opened up Facebook. (Mistake #1: Looking at Facebook while emotionally drained.) The first post on the feed was by a new mom and it portrayed a Pinterest-worthy scene of orderliness, peace and control. Ugh! My mouth didn't say it but my mind thought, "Just wait 'til you have toddl-..."
Wait. Did I just starting thinking that terrible thought-sentence?! I caught myself red-handed in the sin of PRIDE mixed with a little envy, I suppose. Yuck. I felt terrible. I repented. And then I remembered. I remembered all the hurt the "just wait" statements have caused in my life as a new wife, as a mom-to-be, as a first-time mom and now as a mom of two little ones. Those unhelpful words made me fear what was to come and, when the time came, there was nothing to fear in the first place. 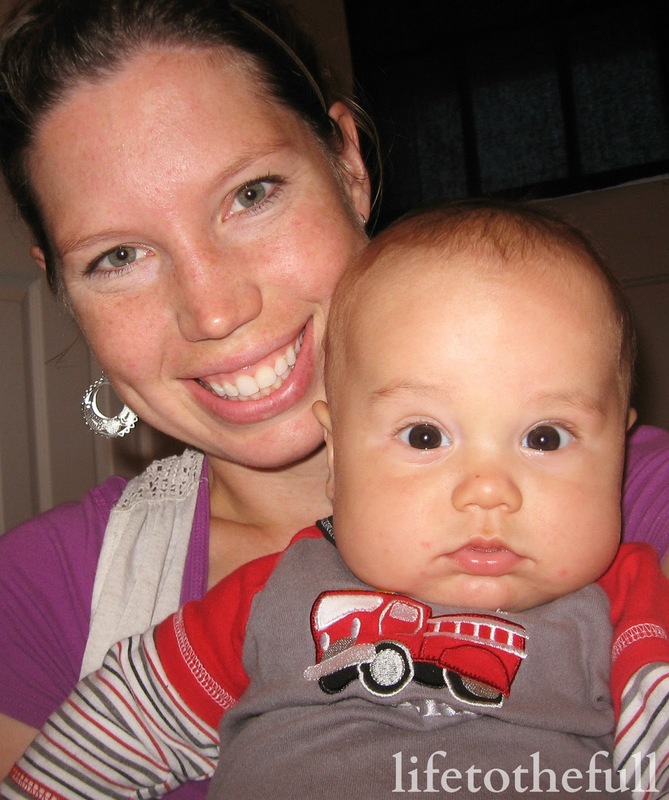 As Susie Larson shares in the "Set-Apart Motherhood" interview with Leslie Ludy, the "just wait" statements place a burden on the younger moms that they don't have the grace yet to carry. They don't have the grace to walk through the future experiences because they aren't there yet! God gives us the grace we need for exactly where we're at and His grace is sufficient for us indeed (2 Corinthians 12:9). After feeling disheartened by the discouraging statements of those more experienced moms, I told myself I would be different. I prayed that God would keep me grounded even when I was a "veteran mom" some day. I'm still no veteran mom but my mission remains the same: I am here to encourage, NOT burden, the hearts of other women. It's just I need to the Holy Spirit to refocus me again. And again. And again. I have a feeling God will continue to shape my vision for motherhood as we move from season to season. Having His vision on my heart helps me to stay grounded even on those "sitting on the kitchen floor staring at the cupboards" sort of days. Saying YES to my identity in Christ. Saying NO to dwelling on the trials in my life. Saying YES to living in victory. Saying NO to constant busyness. Saying YES to savoring moments. Saying NO to fear of the unknown. Saying YES to trusting in God's sovereignty. Saying NO to the world's values. Saying YES to God's vision for my life and my family. There is a better way to life than what the world shows us. Motherhood is a beautiful and challenging privilege that the Enemy cannot be allowed to overshadow with bitterness, fear and resentment. Here's to God's grace, the joy and honor of being a mother and a new day in the set apart life. All for the glory of God! Harvest is rolling by one day at a time and praise the Lord for this beautiful weather! Life lately feels like the "Groundhog Day" movie where the same day keeps playing over and over and over. The days are really long and everyone is worn down. Lately I haven't been able to fall asleep until my husband comes home around 10 or 11 pm and it's making the whole 5:30-wake-up-thing a whole lot less appealing! Sometimes I wish my husband could predictably come home in time for supper every night but that's just not the farming life. Growing up on a farm myself has helped as my dad was rarely in for supper time and there was (still is) always work to do. But, you know, having a normal family schedule does sound appealing on the long days! Farming has been part of my life from the beginning and I do love it. I am thankful that my husband works for a very family-oriented farm that brings all the families together for supper in the field on harvest nights and we do have our Sundays together. I'm thankful the kids get to ride in combines, see daddy work and the fellowship with the other families is really great. My husband loves farming and I love seeing him do something he loves. Some of my favorite times with my dad were spent riding on the fender of his swather. Bumpy and loud, but special none the less. I trust that God has us right where He wants us at this moment in time and it really is a wonderful way to raise a family. Running and farming just do not go together! Spring races mean it's planting time; Fall races mean it's harvest time. It was a miracle that my husband was able to watch me run the marathon back in May (and we even celebrated our wedding anniversary)! 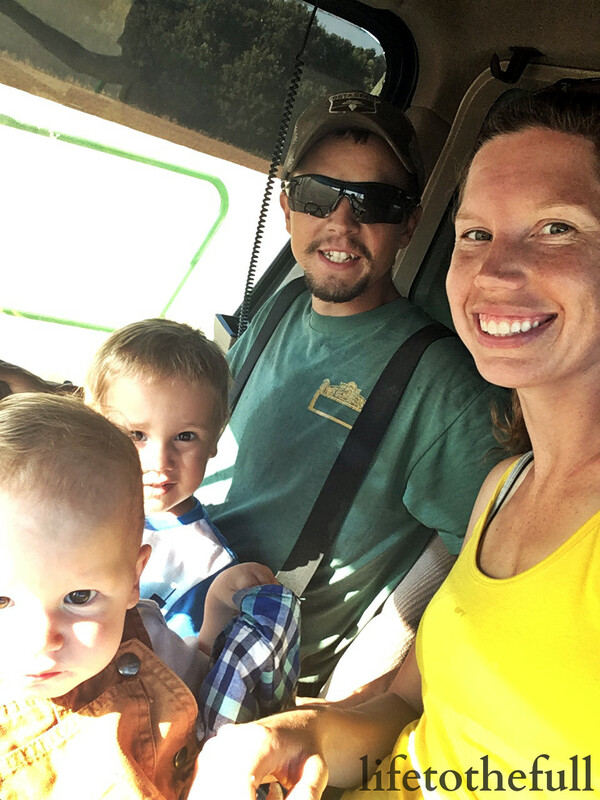 Time off during the busy season is a pretty big deal in the farming world! Since it's busy harvest time, that means my next race must be near. One month to go! What is left on your race calendar for this year? What time of the year is busiest for you/your family? Easy-Effort: 8 mi, 01:13 @ 09:11 pace. Speedwork with double stroller: 6 mi, 00:48 @ 08:01 pace. 5 x 800m @ 8:01, 7:42, 7:41, 7:53, 7:41/mile pace with 2:00 recovery jog in between. Strength: 6 x 1:00 plank series. 80 degrees felt so hot this morning! Strength: 2 sets of - thrusters, bicep curls, rows, flies, tricep kickbacks, running arms. Tempo: 8.65 mi, 01:06 @ 07:39 avg pace. 2 x 3.75 miles @ 7:32, 7:24/mile pace. Easy-Effort with double stroller: 6.02 mi, 00:56 @ 09:13 pace. Strength: Mowing the lawn with the pushmower. Perfect cool morning! Temps in the 60's feel amazing and running felt easier. Long Run: 20.2 mi, 02:54 @ 08:36 pace. Running the 20-miler without music ended up being a totally refreshing and worshipful time. I loved it and I really need to do that more often. I love how music drowns out my tiredness and my tired body's whining, but a break from music was really nice. Praise the Lord. Praise the Lord, my soul! Since dedicating my life to the Lord five years ago, prayer has been something that leaves me awestruck. To think that the Almighty God wants to talk with me, one on one, is mind-blowing and also a bit confusing. I have had many questions about prayer over the years, some I have asked and some seem so silly I didn't dare ask anyone. Why does God want to talk to me? Do my prayers really matter? Does He answer our prayers? Do I ask God for too much or do I not ask enough? Do my prayers make a difference? Intercessory Prayer by Dutch Sheets has helped to grow my understanding of prayer and the necessity of a prayer life. He has a way with words that explains deep theological concepts without totally losing a non-theologian like me. Having a better understanding of the "how's & why's" of prayer has inspired me with courage to pray for the impossible and has motivated me to be more persistent in my prayer life. I highly recommend Intercessory Prayer as a book for individual study or as a group Bible study. It is available with a study guide, 8-session DVD and youth edition as well. Learn more about Intercessory Prayer on Amazon.com. Disclaimer: I am sharing my thoughts and my personal experiences to encourage those in need of encouraging and celebrate this journey in my life. This is not in any way meant to ignite a "mommy war". Three years ago, I left my position as a corporate graphic designer to stay at home with our son full-time. That was one of the most stressful and pivotal decisions of my life. It was a leap of faith and many doubts and fears crossed my mind. Fast forward to three years later and here I am, alive and well! I am still working as a full-time mom with two busy boys in tow and part-time as a graphic designer and blogger. Huh, yeah, I really didn't think my "hobby blog" would grow into a part-time sorta thing! Will I be bored staying at home? Nope. Nunca. Boredom has never been a problem because there is always something to do or that should be done. Now the question is... do I really want to do the thing that needs to be done? Confession: I tend to procrastinate putting away the laundry. Will I waste my degree by staying at home with my kids? Not for one second would I consider caring for my children and serving my family a waste of anything! Having a degree in graphic design has been handy because I am able to do freelance work from home. Plus, spending time with little people is quite intellectually stimulating in itself! Our 3-year-old puts me to the test with his insightful questions, especially when it comes to theology and faith in Jesus. Honestly, I have learned so much from our children! Will I miss out on adult interaction? Well, if you never leave the house, you likely will miss out on adult interaction. This was a big fear of mine because I was surrounded with adult-persons all day at my office job. Transitioning to a full-time at-home mom wasn't as painful as I expected because the kids and I visit with adults on a daily basis. Whether it's meeting with friends, talking with neighbors, fellowship with our church family, or small-talk at the library or grocery store, there are plenty of opportunities for adult interaction. The key is putting yourself out there, especially when you're a new face in town. It's hard and at times awkward, but someone has to start the conversation! How will we live on one income? This was the #1 question I received when it was announced I was leaving my job. Living on one income requires living within your means, thinking on a budget, being debt-free (or at least moving in that direction), and trusting God's faithful provision. Is it enough to be "just" a mom? Simple answer: Yes. It's a blessed and wonderfully calling. Being a mom is the most important ministry opportunity that I will ever have! Some moms choose to dabble in a side business (i.e. selling books, tupperware, nail decals, etc.) or to work a part-time job. I design and blog part-time because it is an enjoyable creative outlet for me and a chance to make a little extra income. It certainly doesn't give me more value as a person. Being "just" a mom is enough. Being a child of God is enough! Will my house finally be clean when I stay at home? If you have children that are capable of moving themselves, NO. While sitting at my desk pondering the future as a stay-at-home mom, I pictured my house neat and tidy with meals always ready to go and Pinterest-worthy. So maybe my vision of staying at home was a bit off. A little, a lot. When our oldest was in daycare and I was working out of the home, we left the house in the morning and nothing moved until we came home. Now, with two toddlers in the house, a clean house turns into a battlefield in a matter of minutes. They leave what I call "snail trails" of debris behind them. Thankfully, the 3-year-old is becoming more responsible and helps clean up. One-year-old... not so much. How will my kids learn to socialize? This is similar to the adult interaction question. Though I will say that parental interaction counts as socialization, assuming the parent actually interacts with the child. Children's social skills grow greatly as they live daily life in the home, out of the home, at the playground, at the store, visiting friends, so on. Socializing is everywhere IF you put yourself in social situations. And then there are siblings where "teachable moments" naturally abound. Numerous times a day our toddlers are learning lessons about sharing. Sharing mommy, sharing toys, sharing food, sharing the dog, sharing a bedroom, sharing paper, sharing an empty milk jug. Who knew a one-year-old could torment his older brother so well! Will I be able to return to the "professional world" someday? Just before resigning from my job, this question came to mind. I had just received a raise, I enjoyed what I did and most of my coworkers. My job was comfortable. "Will anyone ever hire me again?" I chose to trust God's plan, knowing that when He wants me to return to working out-of-the-home, He will open the doors necessary. Trust is a scary thing but if anyone is to be trusted, it's Him. 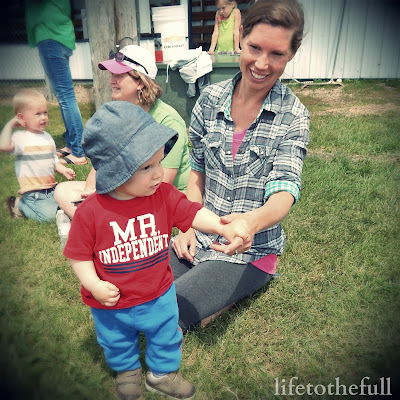 What if I don't like being a full-time mom? After only one week of maternity leave, I was a hot mess. I didn't like staying at home with our son because I felt trapped and lonely. Blame it on the postpartum hormone rollercoaster perhaps, or the shock of being a parent for the first time ever. Thanks to the encouraging advice of a couple veteran moms, I took it one day at a time with my teeny tiny newborn. I went into maternity leave in tears over being stuck at home but, when my leave ended, I was in tears dropping him off at daycare for the first time. They say you get used to being away from your kids all day but I knew I didn't want to get used to that. It took time to adjust to staying at home with my son and when I resigned from my job I was ecstatic to spend my days with our little boy again. The days with our two boys are exhausting and some are easier than others, but I wouldn't trade this for the world. These little people grow up too quickly and I don't want to miss a thing. When I compare myself three years ago to myself now, I know that being a full-time mom has greatly changed me for the better. Marriage, child-raising, and life in general is a sanctifying process. I have fallen in love with literature. I'm sure I have read more books in these past three years than in my entire life combined, whether it be "Little House on the Prairie" for the kids or Charlotte Mason's philosophy on education for my own personal learning. I have written more than ever before and, this blog!, it's been an opportunity that God placed in front of me. This certainly wasn't on my radar! I have rediscovered the peace of playing piano. And the absolute hilariousness of our "family band". Daddy and E on their guitars, Mom on the piano, and Wes playing the drums (two pencils and a tupperware container). The kids are teaching me to slow down and appreciate the little things. Watch the clouds float by. Follow an ant down the sidewalk. Set out on imaginary hunting excursions. Practice our skateboard tricks. Name the colors in the sunrise. Being a full-time mom has grown in me a love for learning, it has taught me to appreciate the moments that really matter, and it has strengthened my walk with the Lord Jesus Christ. Three years ago, I left my comfort zone because of the Lord's prompting and He has proven to be ever faithful. He always has been, always will be, no matter what the future will bring. Linking up with Mommy Moments and Titus 2 Tuesdays. This week we enjoyed our last camping trip of the year! Because harvest is in full swing, the little ones and I snuck away with Grandma. It was a special trip — a Mother/Daughter + Sons Camping Adventure. Despite stormy weather in the forecast, we went on a group bike ride/run, splashed in the Mississippi Headwaters and put those rolling hill bike paths to good use. 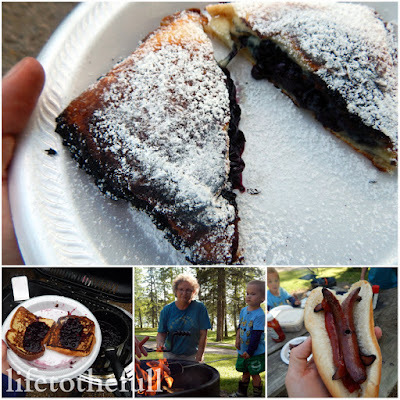 We ate a lot of amazing campfire food prepared by my mom like ham & cheese pockets and "spider" hot dogs. My favorite was easily the wild blueberry turnovers topped with powdered sugar. 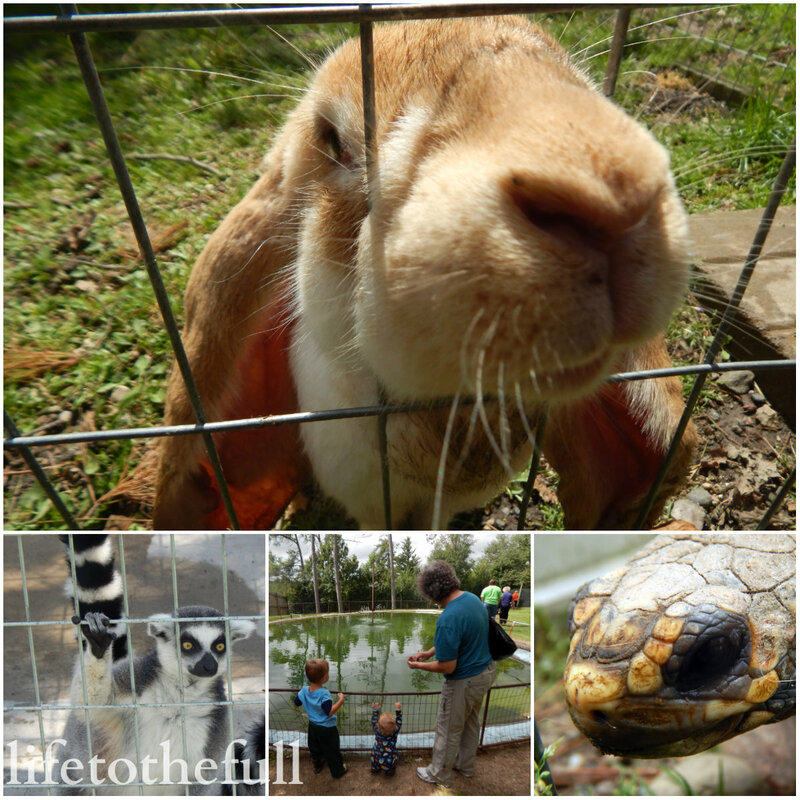 On one of the more gloomy weather days, we drove to a small local "zoo" called Animal Land. The little ones really got a kick out of the animals. They had quite an assortment for such a small place, from the "Tortoise and the Hare" to lions and camels. 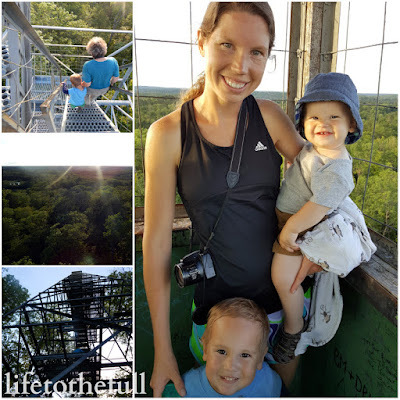 And we climbed a 100 ft. firetower... with the 3- and 1-year-old. Yikes. That was a big feat for me, as I'm not a huge fan of heights! Pretty sure I'm the only one that was scared. Grandma and the kids thought it was great. After the .5 mile walk there, climbing the tower, and the .5 mile walk back, we were all ready for bed that night. Before we drove to my parents' farm on Friday, I went out for a long run on the beautiful tree-lined bike paths. The mid-morning weather was toasty so I wore my Camelbak and tested out my SLS3 Neon Sport Socks. My usual Fitsoks are great for cool weather running but they keep my feet too warm on hot weather runs. Fargo Marathon this year was a fine example of that. Hot feet, nasty blisters... ouch. 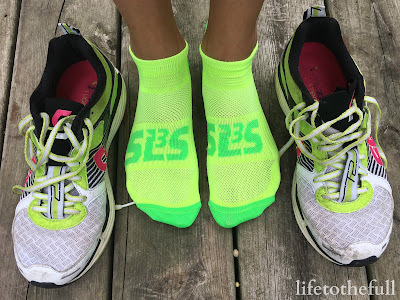 SLS3's Neon Sport Socks kept my feet dry, they stayed in position during the run and, after 13.6 miles, I was still blister-free! Use the code "DKJIJERK" to get $5.00 off a 3-pack of these socks. Easy-Effort: 7.51 mi, 01:09 @ 09:09 pace. I was out the door at 5:45 and fit in as many miles as I could before 7:00 am... when the wild things wake up :) Then we spent the morning at the park, riding bike and in our back yard. Speedwork: 6.04 mi, 00:48, 07:52 avg pace. 6 x 800m @ 7:37, :25, :19, :09, :23, 6:55/mile avg pace. Packing and traveling for our camping trip with Grandma! Easy-Effort with double stroller: 5.16 mi, 00:50 @ 09:44 pace. Ran to the Mississippi Headwaters and back with the littlest in the jogging stroller. Big brother rode on the back of Grandma's bike! Hiked 1 mile with 1-year-old in arms and climbed 100 ft. tower. Long Run: 13.64 mi, 01:55 @ 08:24 pace. Hilly and hot long run! I will appreciate the flat course on race day after this run. I "borrowed" the toddler's whistle that he got at the fair just in case I ran across any wild animals. This campground is very "city-like" and I haven't seen any bears on the trail personally, but better safe than sorry. Easy-Effort: 4 mi, 00:39 @ 09:50 pace. Strength: 6 x 1:00 planks. Leg raises and bridges. Easy run and a great visit with my sister-in-law! REST! I'm wiped and will take the next day off as well. Better rested than sorry. I mean, they're kind of similar, right? Except marathon training includes a rest day or two and toddlers just don't get that! My approach to marathon training with small children at home is what I call "minimalist". Minimal mileage with minimal time spent training usually on minimal recovery. 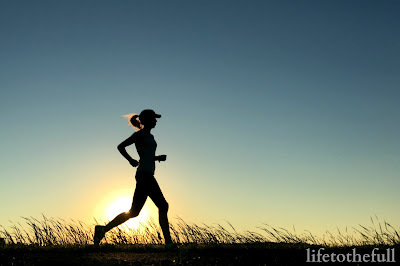 Running 30-45 miles a week sounds like a lot to the average person but to a marathoner, that is low, wayyy low. It's not that I don't enjoy running higher mileage; this is just a realistic number for my life right now. Running for me needs to stay fun rather than becoming another item on the "to-do list". Keeping expectations realistic for your current life season makes everything more enjoyable. Even marathoning. Blogging can paint a picture of perfection and I am far, so far from perfect. Let me be "real" here with the struggles of mixing motherhood and marathoning... and why I do it anyway. My biggest struggle with marathon training is TIME. Surprise, surprise! Isn't that everyone's struggle? "I just have too much time on my hands," said No One Ever. 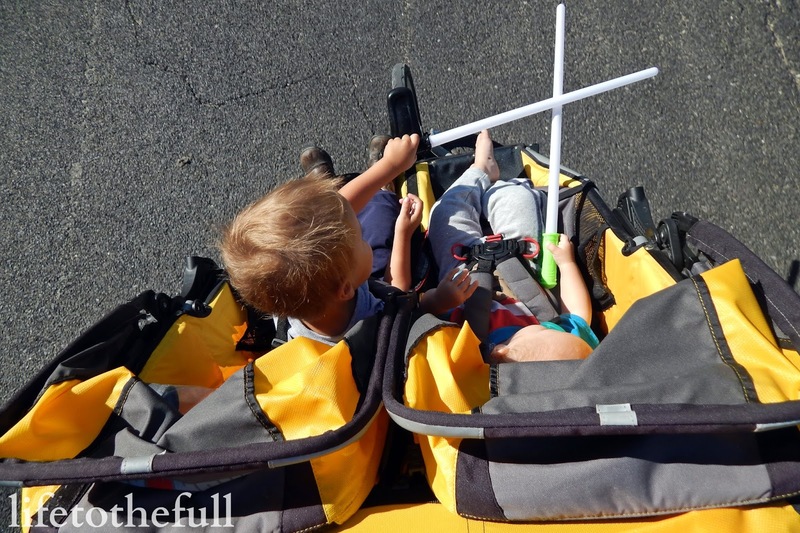 In order to not skimp on family time, kid wrangling and daily duties, I fit in most of my workouts in the early morning hours or mid-morning with the kids in the double parachute stroller on fair weather days. Praise the Lord for running strollers! 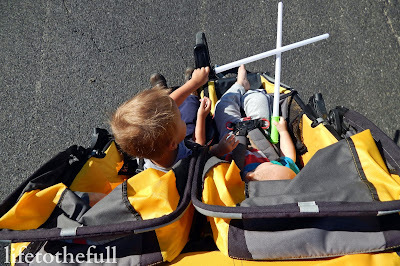 The kids enjoy a ride in their yellow chariot and mom gets a workout. Win, win. Weekday runs are relatively short, like one hour or less, with my minimalist method of training. The weekend long run of 2 to 3 hours is a little more tricky but my husband is very helpful. He often watches the kids while I leave to run at 5:30 or 6:00 am on Sundays (or Saturday, if he has the day off). Meet my second biggest struggle, GUILT. I often feel guilty doing something for myself. Taking time to exercise and refresh the soul is important, as long as it doesn't turn into a self-entitled attitude of "I deserve this!". I do feel guilty asking for help and leaving the kids when I go out for a long run or on race morning. Guilt is a problem for me. I warned you, I am NOT perfect. Struggles aside, making time to train as a mom of little ones is worth it for me. On top of the health benefits of regular exercise—stress relief, increased energy, healthy weight, positive body image—spending that time outdoors, breathing in the fresh air leaves me feeling refreshed and revitalized. Healthy competition and pushing my limits motivate me. 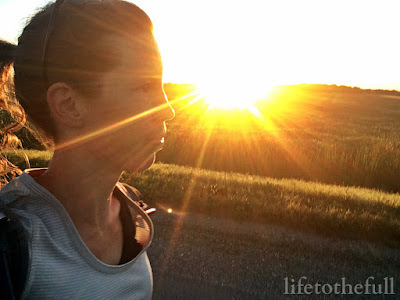 I've found that those miles of running serve as a re-boot that God has wired into my soul. Peaceful moments on the road to think, pray or to simply exist are all a blessing from Him. "I think it is a definite gain to the whole family when mother is able to take a little time to pursue her own interests, whether they be crafts, painting, sewing, gourmet cooking, a literature group, gardening, nature study, going to plays or ballets with her husband, bicycling, or ice skating. 'I have no time for these simple pleasures,' is the mournful cry. Yes, there isn't time for all of them. Think seasonally. One interest per season, coupled with thirty minutes of reading a day, may be all that is needed to keep up the Mother Culture and regain any lost enthusiasm for living." Karen Andreola, "The Charlotte Mason Companion"
How do you refresh your soul in your current season of life? My body said it needed more rest, so an extra recovery week this became! "Easy-Effort" Double Stroller Run: 9.01 mi, 01:22 @ 09:05 pace. This was supposed to be an "easy effort" run but it wiped me out (the hot temps didn't help). Woops! Probably over-did it. Speedwork: (Treadmill) 4 mi, 00:31 @ 07:40 avg pace. WU, 3 x 1k @ 6:38/mile pace with 2:30 recovery jog in between, CD. Strength: 6 x 1:00 plank series, core work and push-ups with an old exercise VHS we found at a thrift store! Tempo: 6.26 mi, 00:47 @ 07:32 pace. WU, 2 x 2.25 @ 7:10, 7:15, CD. Easy-Effort with double stroller: 3.2 mi, 00:30 @ 09:17 pace. Easy-effort run with the double stroller only half loaded as the youngest and I "ran" some errands. 30 less pounds makes the stroller push like a dream! "The Plan" said 10k Time Trial, my body said "No!". I skipped the long run this week to get some extra rest before a week of bigger mileage. There are so many resources out there for parents and teachers these days! How do you decide what resources are right for your family? Reviewing educational resources and reading the reviews from other parents and teachers has helped me to sift through the endless abyss of options! Today I'm sharing with you my review, as an Academics' Choice Advocate and reviewer, of the books Time for a Story, Learning is in Bloom, and the Lorax app. We have a lot to cover, so lets get started! Time for a Story by Amy Read and Saroj Ghoting explores fun and engaging ways to talk, sing, read, write, and play with infants and toddlers. The authors note that the most important item or tool that a teacher or parent has in preparing children for later reading success is a book. Because story time can be complicated with impatient babies or active toddlers, this book provides the thought and preparation to help you can maximize the reading experiences of these little learners. Time for a Story is a common sense approach to reading to young children and I think it is best geared toward new teachers and possibly new parents. It didn't include any mind-blowing tricks to help little ones learn but it does stress the importance of reading, and that I can appreciate! "Learning is in Bloom" by Ruth Wilson shares the importance of a child's time spent in nature and encourages teachers and parents with 40 hands-on activities. From making a nature notebook to exploring animal habitat, these activities motivate adults and children to get outside and learn! Wilson points out that the children of today are more disconnected from nature than in the past due to the loss of access to natural areas in our neighborhoods and to the increase in the amount of time adults and children spend engaged with electronic media. "Learning is in Bloom" is a resource that I have enjoyed as a parent and the teacher of my children. 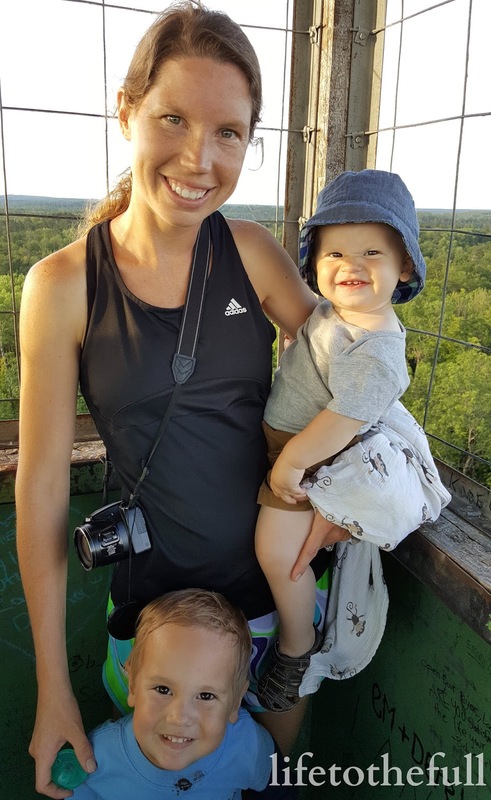 It is in agreement with the teachings of Charlotte Mason that stress the importance of time spent outdoors and the simple life lessons we learn, as adults and children, exploring God's creation. I have a special spot in my heart for Dr. Seuss' stories! Most of all, I love reading the books to my kids. The way the words flow, the creative use of color and odd made-up creatures are something I enjoy. As for the Dr. Seuss' The Lorax app, I'm not a fan. While this app is well-designed and it does in fact tell the story of the Lorax (mission accomplished, in that way), I do not think it should be relied on as a literacy-enhancer for children. There may be a time and a place for phone or tablet apps but reading an actual book is always best. We let our three-year-old flip through this app and he was most impressed with the sounds the story makes when you touch the screen. Personally, our family will stick to reading real books and skip the apps. The parent-child quality time is worth it! Disclaimer: I was sent these products free of charge for my honest review. All opinions are my own. I am a doodler, always have been and hopefully always will be. There are notebooks upon notebooks full of my drawings of horses, cartoon people, imaginary creatures and faraway places! It's my way of getting creativity out of my head and on to paper. Even better, doodling is very relaxing. Our three-year-old and I have been dabbling in Doodletopia: Cartoons over the past couple weeks and we have had so much fun! He scribbles cartoons that mostly resemble tornadoes and requests that I draw superheroes for him. Lots and lots of superheros. Doodletopia author Christopher Hart has filled this instructional book with cartooning prompts and creative inspiration. He gives helpful tips and tricks and then leaves the creative door open for his readers. I really enjoy Hart's sense of humor. My favorite page spread instructs you to draw your "coolest-of-the-uncool" clothes for a hipster. Yes,we have to poke a little fun at the hipsters! This book is an excellent resource for experienced doodlers and aspiring doodlers alike! Doodletopia is available for $18.99 at various retailers. Summer!!! It's wonderful, decently chaotic and fast-moving. The kids have cute little farmer's tans, veggies are being eaten straight out of the garden, and I saw a couple combines in the field already today. Saturday brought my first long-long run (18-miler) for Wild Hog Marathon training and only 2 months remain between now and my last race of the year! 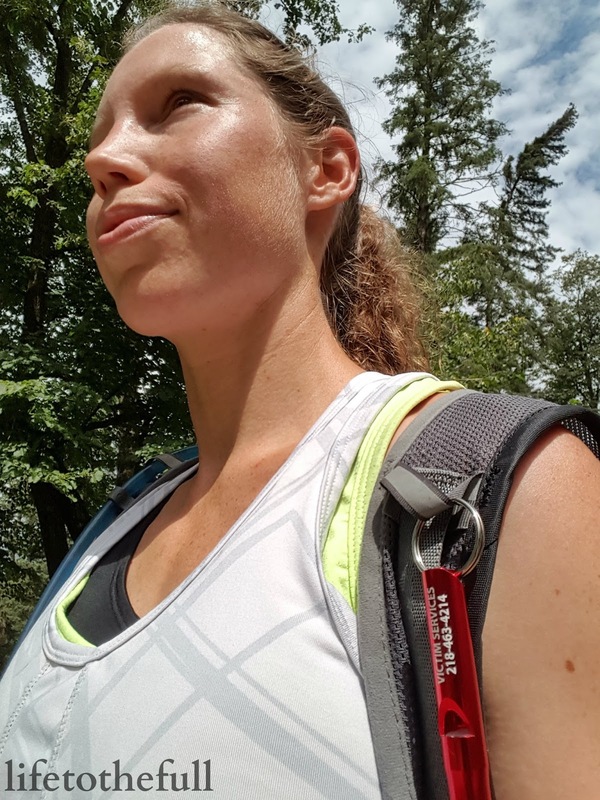 Speaking of running, I have had the privilege of reviewing some amazing products from Swanson Health while training for my 8th marathon coming up in September and I would love to share my experience with you. Swanson Health Products, located in Fargo, North Dakota, sells natural health and wellness products from their website Swansonvitamins.com and they happen to be the United States' largest privately held vitamin catalog retailer! The Hawaiian Sunscreen smells great, like lotion rather than sunscreen, and feels light and refreshing on my skin (not caked on!). Alba Hawaiian Sunscreen, with aloe vera in SPF 30, is perfect for everyday outdoor activities but not ideal for super sweaty workouts. I tested it out on a hot and humid long run and the sunscreen started dripping down my arm. Hawaiian Sunscreen: Perfect for long, sunny days outside. This mascara has a lightweight feel without clumping my eyelashes together! The Truly Natural Mascara isn't waterproof but I made it through a run with it on and it didn't run down my face. I ran, the mascara didn't :) Personally, I prefer the non-waterproof mascara because it washes off with a shower. Truly Natural Mascara Espresso: It's a win! In the running world, I have heard quite a lot about Nuun tablets but had yet to try them. I tried the Nuun Citrus Fruit and Tri-Berry tablets from Swanson Health's website and have been very impressed! These tablets make a delicious sports hydration drink and they are sweetened by Stevia Leaf Extract and Monk Fruit Extract. The Nuun hydration tablets have been perfect for Fall marathon training because most of my running is in the hot, humid weather. Extra sweating = extra electrolyte replenishment needed. I am not a fan of most sports drinks but these Nuun tablets have won me over! Nuun Electrolyte Enhanced Tablets: Essential for Fall marathon training! Tri-Berry is my favorite flavor. Chocolate Cacao Nibs: Perfect ingredient to jazz up any cereal, yogurt, oatmeal, ice cream, cookies, smoothies or coffee. This was a "recovery" week in the first phase of training for the Wild Hog except I had to swap out the shorter long run this week for next week's 18-miler. That negates the whole idea of this being a recovery week. Oh well. Life before training! Strength: 6 x 1:00 plank variations, side leg raises, hip hikes. "Easy-Effort" Double Stroller Run: 6.53 mi, 01:00 @ 09:14 avg pace. This "easy" run certainly didn't feel easy! Hot and muggy mid-morning run with the kids. They seemed to enjoy the ride... As for me, I was sweating buckets! Strength: 6 x 1:00 plank variations, bridges with leg raise. Long Run:18.01 mi, 02:38 @ 08:45 avg pace. Practicing negative splits... Need lots of practice in this! I broke this run up into three 6-milers for pacing practice. 9:00, 8:43, 8:33 averages.